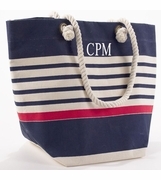 SOLD OUT AND DISCONTINUED...This tailored and tasteful nautical canvas tote may become your favorite for seaside vacation travels or boating. Lightweight open tote for souvenirs or market shopping. Quality constructed canvas material in natural. Navy blue embroidered anchor with four inch bottom panel of navy and white anchor pattern contrasting material. Double stitched solid navy handles. Available with your choice of monogram, name or initial for personalization. 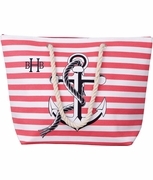 The nautical day traveler tote measures 15W" x 17"H x 6" across bottom. Open tote.